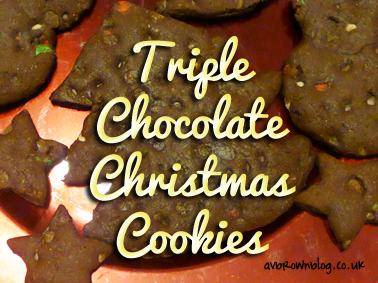 Yesterday I felt like doing some Christmas baking so I had a go at making some triple chocolate cookies. They turned out pretty well, even if I do say so myself. Kids would easily be able to join in with this recipe and the cookies would make nice gifts for family and friends if decorated and boxed. I used a mix of milk and white chocolate chips and red and green M&Ms. I also used Cadbury Bournville cocoa powder, which gives a very rich flavour (like a chocolate brownie). If you prefer a milder chocolate flavour you could use drinking chocolate rather than pure cocoa or you could skip the chocolate altogether and just have vanilla chocolate chip if you prefer. I decorated using Dr. Oetker edible gold shimmer spray. The cookie cutters I used were in the shape of stars, angels, candy canes and bells. I also did some freehand ones in the shape of Christmas trees and snowmen, but you could do anything really. 1) Pre-heat the oven to 180 degrees C.
2) Cream the butter and sugar together in a bowl until light and fluffy. 3) Beat in the vanilla extract and eggs. 4) In a separate bowl, sift the flour, cocoa and baking powder together until an even shade. 5) Add the flour mix to the creamed mix gradually, stirring as you go. 6) Mix in the chocolate chips until combined evenly throughout mixture. 7) Mould into a ball of dough, dust work surface with flour or icing sugar and roll out dough until just a few millimetres thick. 8) Cut out shapes using cookie cutters (or a sharp knife if making free-hand shapes) and place on a baking tree. 9) Bake in the pre-heated oven for 12 minutes, then leave to cool on the baking tray before transferring to a wire rack. 10) Dust with edible glitter or decorate with writing icing if you wish. Do you have a favourite Christmas recipe? Feel free to share in the comments. « Thoughts on the casting of Hermione: Does the race of an actor really matter?